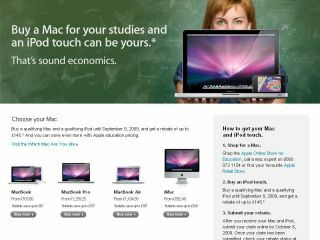 Apple has unveiled an offer that allow teachers and students to get their mitts on an iPod touch when they buy a Mac. Apple's 'Back to School offer' sees people who 'buy a qualifying Mac and a qualifying iPod' handed a £145 rebate voucher. Apple also points out that you can save even more with Apple education pricing. The offer, which runs in the UK until September 8 2009, is similar to a well-received 'back to school' offering made to the US market each year. Only full or part time students, teachers, lecturers or 'executives working at education establishments' qualify for the offe.